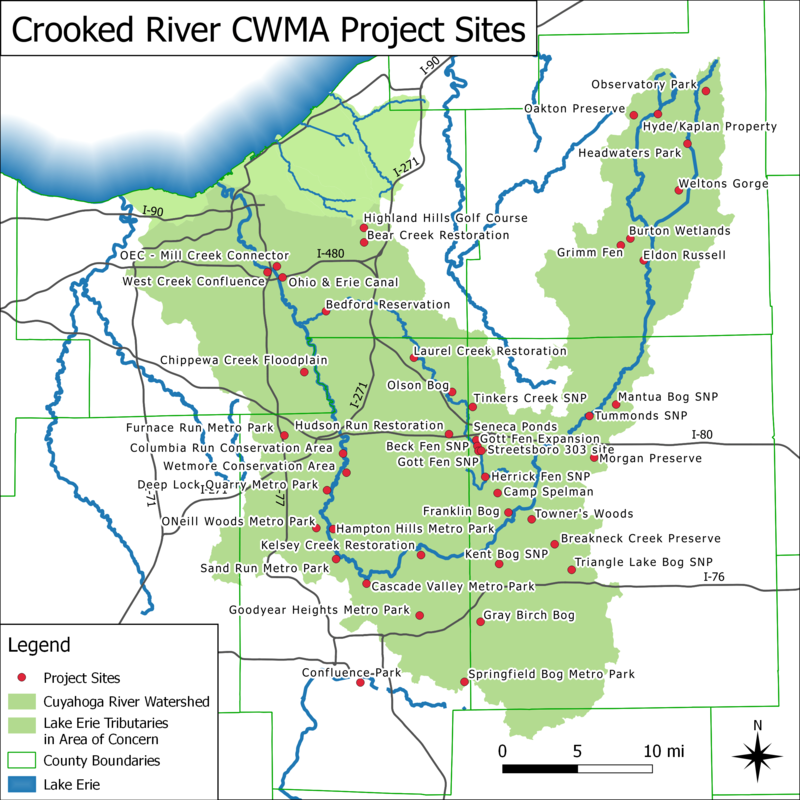 The Crooked River Cooperative Weed Management Area (CR CWMA) is a collaboration of major land stewards and other landowners in the Cuyahoga River watershed of the Lake Erie basin, all motivated by conservation of land and biological diversity in Northeast Ohio. The purpose of CWMAs is to share knowledge, staff, equipment, and material across jurisdictional boundaries for invasive species detection and management. Each Cooperative Weed Management Area is organized around geography and one or more species. The CWMA is based on a Memorandum of Understanding (MOU) among the partners. In the Cuyahoga Watershed, several agencies have hosted seasonal crews who worked with land managers across the watershed. We also share some large and small equipment, and we have a mobile tool cache of equipment and supplies for crews or for volunteer projects. Cuyahoga Valley Environmental Education camp joined for a project in 2015. Crooked River CWMA crews combined forces at Observatory Park in Geauga County in 2014. Crews worked at Olson Bog at Summit Metro Parks in 2014. Removing invasive snails at Summit Metro Parks, 2012. National Park Service Ranger teaching youth about invasive species, 2015. 2014 CWMA crew preparing for work. We focus on the Cuyahoga River watershed and the Cuyahoga River Area of Concern, in particular on areas of high conservation concern in nature preserves, parks, and watershed conservation sites. The species list for the CR CWMA is broad, and is likely to expand to species which are new to the region, or not yet arrived. Participation in the Crooked River CWMA takes several forms. There are two types of signatories to our Memorandum of Understanding, depending on how deeply involved with land management a participating agency or landowner is. We have a Steering Committee to assist with work plans, community projects, and outreach. Equipment and supplies available through the Crooked River CWMA ranges from hand tools to backpack sprayers and personal protective equipment, to some heavy equipment for large-scale restoration. We have a trailer containing complete equipment for field crews or volunteer projects which is part of the seasonal crew set-up. The cooperative works because the partners are directly involved in all aspects of the work. No single agency, including the CWMA itself, has all the resources necessary to combat invasive plants on a regional scale. By bringing what we have to the table, we are collectively able to tackle problems that may have seemed insurmountable. Grant awards from the Great Lakes Restoration Initiative and the National Park Service, in-kind contributions from numerous organizations. Project participation from Summit Metro Parks, Cleveland Metroparks, Geauga Park District, Cuyahoga Valley National Park, The Nature Conservancy, Ohio Department of Natural Resources, Tinker’s Creek Watershed Partnership, Student Conservation Association, Summit County Youth Employment for Success, Conservancy for Cuyahoga Valley, and others. Employment of nine seasonal stewardship crews across four counties since 2012. Well-organized and trained invasive plant crews worked safely and effectively, which in turn builds confidence and momentum for additional agency funding. Small, focused crews expressed high levels of job satisfaction, especially for the hands-on learning opportunities. The use of seasonal invasive plant crews is an ongoing professional development path for the Lake Erie watershed, where professional contractors for stewardship are in short supply. The purchase of a cache of shared equipment was focused on the CWMA crews for the duration of the grant; now the equipment are widely available to members of the Crooked River CWMA. The two components of this program are twofold: first, the smaller tools and equipment are suitable for agency work crews or volunteer projects, easily shared from a covered trailer; second, the sharing of large equipment (the compact track loader, all-terrain vehicle, seed drill) among trained agency professionals.